A few years ago, there was a rumor going around that the end of Avengers: Age of Ultron would see Hulk blasted into space after posing too much of a threat to humanity. This would have opened the gates for a solo Hulk movie based on the popular Planet Hulk storyline, one that would end with Hulk heading back to Earth and becoming a potential villain for the Avengers to deal with in their third film together. However, none of that came to fruition. Sure, Hulk ended up exiled at the end of Age of Ultron, but that was of his own doing, and it wasn’t in space. And as we know now, The Avengers 3 will instead be focusing on the Infinity War. But Hulk will have plenty to do in Thor: Ragnarok, the movie that Mark Ruffalo describes as an intergalactic buddy movie that teams up the big guy with the God of Thunder. Now new details indicate that part of the Thor sequel will stand-in for a Planet Hulk movie. Find out more below, but beware of potential spoilers for Thor: Ragnarok. 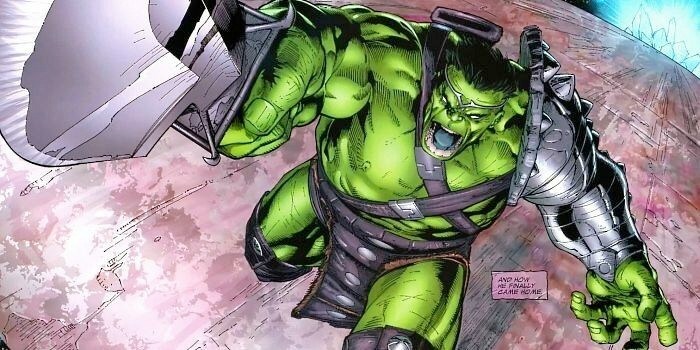 JoBlo has the rumored details on Thor: Ragnarok, which would make it a mash-up of sorts with the Planet Hulk story. We don’t know how much of Planet Hulk will make it into the movie, but according to their sources, at some point Thor will end up on another planet where he will discover Hulk being part of some gladiatorial games. Those games are being overseen by The Grandmaster, the character recently announced to be played by Jeff Goldblum. Hulk will be sporting the shoulder armor seen in the Planet Hulk, but beyond that, we have no idea how he ended up there just yet. This will likely be the point that Thor and Hulk end up teaming up for that intergalactic buddy movie that Ruffalo mentioned before. But what will they be up to? The same scoop says that Thor is looking for some kind of weapon that will prevent Ragnarok from destroying Asgard and presumably the rest of the universe. Could that weapon turn out to be Hulk? Or will they just have to team up to find it? Is there a chance that Hulk could end up being what helps destroy Asgard, perhaps bewitched by another villain? These are all questions to which we don’t know the answers. All we know now is that Chris Hemsworth is back as Thor, and he’ll be joined by at least Jaimie Alexander as Lady Sif. Newcomers to the cast include Tessa Thompson as Valkyrie, Karl Urban as Skurge and Cate Blanchett as Hela. What We Do in the Shadows and Hunt for the Wilderpeople director Taika Waititi will be at the helm of Thor: Ragnarok and it will arrive on July 28, 2017.. The post ‘Thor: Ragnarok’ May Bring Some ‘Planet Hulk’ Elements into the Mix appeared first on /Film.